I’m in my mid-twenties, with a considerable amount of grey hair. Apparently grey hair does not care about the age of their host. No, I’m not overly stressed, in fact, I’d consider myself Zen as all heck…But that’s beside the point. Having this hair ‘situation’ has led me to overly process my hair in all sorts of ways. With the entire dying, lifting colour, not to mention the styling with heated tools process, boom. Fragile hair. The last time I went to get my hair cut, I asked the hairdresser to thin it out a bit. She replied with “hmm, are you sure? It’s already a bit too scraggly, and since you want to keep the length, umm…(Insert disapproving headshake).” Well, okay then. Humph. Here is where we get to the point. I tried the Schwarzkopf BC Time Restore Gift Set. I used the shampoo, conditioner and rejuvenating spray, once. Then, I went to get another hair cut to just chop it all off to. A fresh start. I convinced myself it was for the best…Even if I came out with a pixie (eek). The hairdresser (a different woman than the last time), explained that chopping it all off is a bit extreme since the weak and damaged hair was only at the very tips, all I needed was a trim, not even an inch. What?!?! I can’t remember the last time a hair dresser told me my hair was even close to decent shape! Now, I can’t be sure it was the Schwarzkopf Time Restore products, heck, maybe I gained a really odd superpower that allows me to will my hair into a healthy state…none-the-less, I haven’t put my hair up in a ponytail or bun since I last used this product. I’m going to use it all up and hopefully comment on this post if it improves more. The products that come in this gift set are the Cell Perfector/Time Restore shampoo (205ml), conditioner (200ml) and the rejuvenating spray (200ml), which are normal sized products…But if you’re anything like me, you buy a liter of shampoo at a time so they may seem small. Hah. The box alone is lovely. Not something I would buy for myself, but as a gift set, I’d definitely get future use out of the box to store other items in a pretty fashion…Like my nail polish that desperately need a new home. Overall, it’s a luxurious product; I feel a bit spoiled when I use it. I’d say this is a pretty nice gift for someone close to you who is concerned with the state of their hair. The other beauty gift boxes are Color Freeze, Moisture Kick, Repair Rescue and Fibre Force. Schwarzkopf Professional BC HAIRTHERAPY Beauty Boxes are now available, exclusively at Schwarzkopf Professional partner salons for around $37.95 and $42.90 for the Fibre Force variety. Disclosure: All opinions are my own. 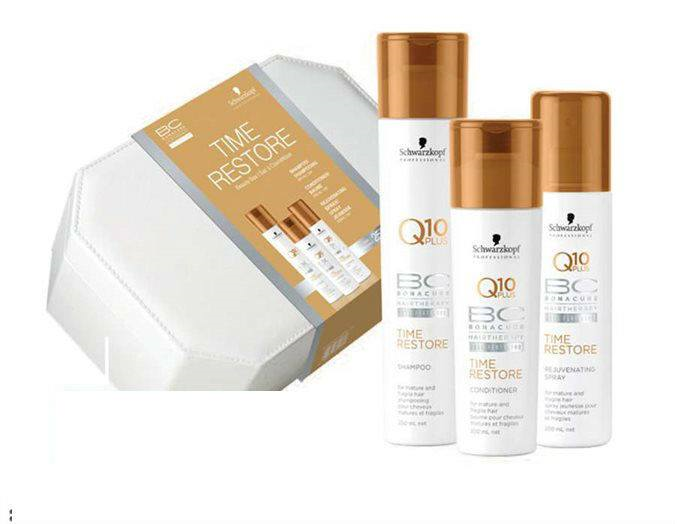 I received BC Time Restore Gift Set at no cost for the purpose of this review. No other compensation was received.